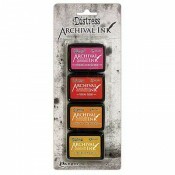 Acid free, permanent and waterproof dye ink from designer Tim Holtz. Use this reinker to refill your Archival Ink pads. Package contains one .5 oz bottle of archival ink. Matching ink pad available and sold separately.